Have you ever opened the wardrobe and realized that the contents were crowded? Especially if your wardrobe is a minimalist sized closet or small. Getting rid of then donating the contents of a wardrobe that is old or no longer used may be an alternative for you to increase the capacity of your wardrobe. However, in fact, even if you only have a small cupboard, it can also be too crowded. Well, here are some ways. Get to know the characteristics of your clothing collection. This will help you determine the organization of space in the wardrobe. Say, if you have more bosses and subordinates that are short in size, you can put two coat hangers in a multilevel. That way, one room can store twice as much in a wardrobe. Group clothes according to certain categories, also effective ways to organize space in a wardrobe. For example, you can group clothes based on their type, shirts with shirts, shirts with shirts, pants with pants, bags with bags, and so on. You can use the inner side of the wardrobe door as additional space. How, install one or two towel hangers that are commonly used in the bathroom, so that the side in the cupboard can be used to store scarves, scarves, bags, and other accessories. 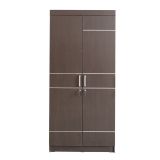 The CLS 201 2P wardrobe from Lunar Furniture is designed so beautifully that you will be able to store your fashion collection neatly and safely. Contact Lunar Furniture immediately at 021 54376 555/333 or click www.lunarfurniture.com for more info.